Fortunately, our bodies have been fighting cancer for far longer than we’ve been studying it and, now, researchers are exploring ways to bolster and modulate our immune defenses to better attack cancer. Combing our knowledge with our bodies’ natural abilities, we’re gaining new ground in the fight against cancer in its many forms. We’ll begin by learning how the immune system naturally interacts with tumors and cancer. The immune response to the development of tumors is a complicated and dynamic phenomenon that is interestingly responsible for tumor reduction as well as progression. Dunn et al in 2002, introduced the “Three Es of Immunoediting” nomenclature. 1. Eliminate - Latent tumors are recognized by effector cells of the immune system - cytotoxic T lymphocytes (CTLs), natural killer (NK) cells, and helper T (Th) cells. These cells produce inflammatory cytokines - interleukin (IL)-12 and interferon gamma (IFNγ) - and eliminate cancer cells. 2. 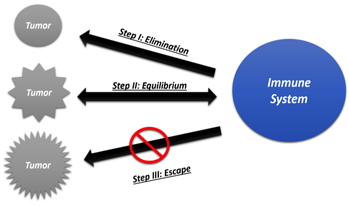 Equilibrium - In a process analogous to the development of drug resistance in bacteria, the tumor cells that escape the elimination stage acquire genetic alterations and alter cell-surface antigen production to evade the immune system. 3. Escape - Tumor cells that survive this phase are able to outsmart the host immune mechanisms altogether and escape future immune surveillance. Dormancy of certain cancers can be attributed to the concept of immunoediting, by way of favorably attaining the equilibrium stage. This can be called “stalemate equilibrium” where the cancer stops growing, and the immune system stops fighting. Such quiescent cancer may rear its head once the body’s immune system is compromised either due to age, infections, or other strenuous biological changes. In contrast to the acute immune responses that eliminate early stage cancer cells, chronic inflammatory responses can augment tumor growth. Indeed, lasting responses to viral infections have resulted in the onset of cancer. Similar patterns of cancer development are observed in autoimmune disorders. Chronic inflammation due to autoimmune disorders is also known to precede cancer development, for example, inflammatory bowel disease is associated with the onset of colorectal cancer. Antigen presenting cells (APCs) that would normally alert the rest of the immune system to the presence of cancer are unable to mature into effector cells in the tumor microenvironment. Tumor cells in this environment produce growth factor signals such as tumor growth factor beta (TGFβ) and IL-10 that suppress APCs. T cells that would normally attack the cancer cells are also suppressed by chemical signals such as IL-8, IFNγ, and colony stimulating factor 1 (CSF-1). Additionally, tumor cells recruit regulatory T cells (T-regs) into their microenvironment by producing C-C motif chemokine 22 (CCL22) and TGFβ. T-regs are suppressive immune cells that restrict the production and activity of other effector immune cells. TGFβ is also known to change CD4+ Th cells into regulatory cells to suppress function. T-regs in the tumor microenvironment produce CTL associated protein 4 (CTLA-4), a receptor that turns off T cell function upon interaction with APCs. Furthermore, tumor cells alter their cell-surface proteome to inhibit expression of co-stimulatory molecules needed for T cell effector function. Cancer cells also produce programmed cell death ligand (PD-L1) that inhibits the cytotoxic activity of CTLs and NK cells. These cells would normally kill cancer cells but are directed not to through these various signals. Over-production of vascular endothelial growth factors (VEGF) in tumors is attributed to a signaling cascade, where lack of oxygen in the tumor, activates hypoxia inducing factor (HIF-1), which promotes the production of VEGF to increase angiogenesis around the tumor. This in turn regulates the expression of the tolerance-producing antigens enunciated above. Finally, signals released from the microenvironment help create tolerance beyond direct proximity to the tumor; chemokine-aided activation of APCs produces modified dendritic cells (DCs) and macrophages (M1 and M2) that help create welcoming environments for tumor cells spreading to other organs during metastasis. Tumor cells over-express CD47 to escape recognition by circulating macrophages. Tumor cells also downregulate the expression of the major histocompatibility complex (MHC) class I proteins on their surfaces to avoid recognition by CD8+ T cells. Conventional cancer therapies include radiation therapy (owing to contributions from Madame Curie), chemotherapy, and surgical removal of the tumor. However, these conventional therapies produce lasting side effects, damage healthy cells, and often cannot eradicate metastasis or eliminate the probability of a relapse. Chemical and radiation therapies cause a transient shutdown of the immune system, hampering its ability to inhibit further cancer growth and subjecting patients to the risk of microbial infection. Chronic inflammation from infection can further divert the immune system from fighting cancer. Surgical removal causes increases in tumor cytokines like TGFβ and IL-6. However, when strengthened through efforts to boost the activity of the immune system, the therapeutic ability of even these conventional antitumor treatment strategies can be enhanced. In lieu of the cancer-immune system interactions, therapeutics have been developed to target the immune cells that aid tumor formation and metastasis, block the cell-surface proteins that help escape immuno-surveillance, and curb cytokine and chemokine production in the tumor microenvironment. Antibodies that block cell-surface tolerance-producing proteins are one of the most commonly used immunotherapeutic agents. Currently the FDA has 12 approved monoclonal antibodies targeting the PD-L1 pathway, VEGF production, and CTLA4 and CD protein blocking. Other molecular targets under research include TIM-3, LAG-3, STAT-3, EGFR, CD20 and CD73 on specific solid as well as blood-based tumors. Monoclonal antibodies have been shown to aide chemotherapy and result in successful elimination of certain tumors. However, antibody stability, half-life, tumor penetration, inadequate concentration, mutation of cell surface targets by tumor cells, are a few of the reasons antibodies may result in a lack of response. Antibodies targeting the tumor-augmenting cytokines produced in the tumor microenvironment TGFβ, IL-10, can also help the immune system attack tumors. Attempts have been made to use whole cell therapeutics consisting of various types of immune cells. Dendritic cells (DCs) are particularly popular whole cell therapeutics because they can help start a sequence of immune reactions that aid in the fight against cancer. Sipuleucel-T by the Dendreon Corporation is currently the only FDA-approved DC therapy for prostate cancer and is aimed at increasing life expectancy by 4.1 months as opposed to curing the cancer. DCs are harvested from the body, and activated ex situ before being injected back into the body in 3 doses intravenously. B cells and T cells activated ex vivo are also contestants for cell-based immunotherapy. Using activated DCs ex vivo to generate cytotoxic effector T cells, and targeting specific DC subsets in vivo using specific antigens to activate them are a few methodologies being researched. Apoptotic and necroptotic tumor cells have also been tested as vaccines and therapeutics. Their uptake by DCs is increased and was shown to reduce tumors effectively in mice. T cells producing chimeric antigen receptors (CARs) on their surfaces have been the most acclaimed form of immunotherapy in recent times. These engineered T cells are capable of recognizing targets like CD19 on tumor cells and exhibit cytotoxic activity. CAR-T cells have consistently shown promise in reducing leukemia and lymphoma and are in their clinical trial phase. In all of the above therapeutics, techniques like genome engineering have played a huge role. For instance, researchers are genetically altering tumor cells and immune cells to knockout proteins involved in immune tolerance. Recently, China spearheaded the first ever CRISPR-based clinical trial in 18 lung cancer patients. This study used CRISPR gene editing to knockout PD-1 on immune cells harvested from patients and thereby prevent cancer cells from using this receptor to evade immune detection. We've only just touched the surface of immunotherapies currently under study. Check out this review for an in-depth look at a variety of up and coming therapies. Tumors are composed of a wide variety of cell types. This cell heterogeneity is an important element of successful tumor progression. A tumor’s genetic composition is constantly in flux and is dependent on the selective pressures placed upon it by its environment and the body’s response to it. Within the tumor, this results in frequent physiological and morphological changes. Tumors differ in their genotypic and phenotypic identities based on their level of progression, anatomical location, characteristic (solid localized tumors or systemic tumors), and ability to metastasize. There have been reports of clinical trials going amiss and patient deaths have occurred during CAR-T cell tests because treatment regimens were not chosen carefully. Participants in clinical trials should be picked based on the immunotherapy target using diagnostic tests and biomarker validation to identify populations that are the most likely to be positively impacted by the trial. During clinical trials, expansion of participants based on early results can enhance the positive effects of the therapy being tested and will help healthcare professional prescribe and identify potential beneficiaries. For the most efficient outcomes, collaborative therapies must be explored. When attacking cancer, multiple immunotherapy targets can be utilized at the same time. A combination of tolerance marker blockade and suppression of tumor-aiding cytokines, for example, will more broadly activate the immune response against tumors. Some chemotherapeutic agents induce immunogenic tumor cell deaths that help activate tumor responses. Similarly, some radiotherapies have caused increased death receptor presentation on tumor cells thus making these cells more susceptible to elimination by T cells. Immunotherapy strategies that synergize with these positive impacts on the immune system will likely have better treatment efficiency. The objective of efficient immunotherapy must be to reach a flexible personalized treatment, and not universal correction of cancer. Also, a single immunotherapeutic target is never the answer to the multi-level barricades put up by cancer. As mentioned in this article, cancers differ in practically every facet starting from manifestation to their specific interactions with different cell types. A thorough understanding of the genotypic and phenotypic changes in the various types of cancer will fuel the development of immunotherapeutics. There are still many important questions in this exciting field of research. One of the most important: How will cancers evolve and mutate based on the immunotherapeutics we use on them? Answering this question will help us keep ahead of the disease in patients and developing collaborative treatments will go a long way in combating this problem. If it is to be successful, cancer immunotherapy must aspire to be a field of healthcare as dynamic as cancer itself. Many thanks to our guest blogger Subhadra Jayaraman! Subhadra Jayaraman is currently a doctoral candidate at Binghamton University. She works on genome engineering and cancer immunotherapy, and is interested in exploring new avenues in healthcare. 1. Vinay, Dass S., et al. "Immune evasion in cancer: Mechanistic basis and therapeutic strategies." Seminars in cancer biology. Vol. 35. Academic Press, 2015. PubMed PMID: 25818339. 2. Curiel, Tyler J., et al. "Specific recruitment of regulatory T cells in ovarian carcinoma fosters immune privilege and predicts reduced survival." Nature medicine 10.9 (2004): 942-949. PubMed PMID: 15322536. 3. Dunn, Gavin P., et al. "Cancer immunoediting: from immunosurveillance to tumor escape." Nature immunology 3.11 (2002): 991-998. PubMed PMID: 12407406. 4. Weiner, George J. "Building better monoclonal antibody-based therapeutics." Nature Reviews Cancer 15.6 (2015): 361-370. PubMed PMID: 25998715. PubMed Central PMCID: PMC4491443. 5. Scott, Andrew M., Jedd D. Wolchok, and Lloyd J. Old. "Antibody therapy of cancer." Nature Reviews Cancer 12.4 (2012): 278-287. PubMed PMID: 22437872. 6. Lee, Daniel W., et al. "T cells expressing CD19 chimeric antigen receptors for acute lymphoblastic leukaemia in children and young adults: a phase 1 dose-escalation trial." The Lancet 385.9967 (2015): 517-528. PubMed PMID: 25319501. 7. Palucka, Karolina, and Jacques Banchereau. "Cancer immunotherapy via dendritic cells." Nature Reviews Cancer 12.4 (2012): 265-277. PubMed PMID: 22437871. PubMed Central PMCID: PMC3433802.